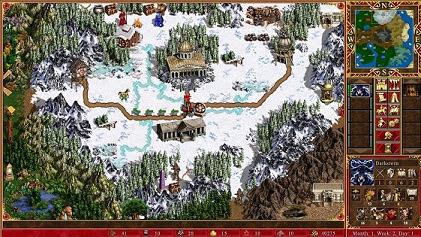 The review in HD as classic and legendary game like Heroes of Might & Magic III is never an easy task, since we are talking about a title of 1999 that left a lasting impression on all who gave it a chance in their time and even today, none of its aftermath has overcome. Therefore, it is now when we have to leave nostalgia aside and find out what Ubisoft offers us this new HD version. What if someone does not know this saga, saying that this is a turn-based strategy game with a strong role-playing component? Our goal is to explore gigantic maps collect resources while we level up our heroes, recruit troops, we face the champions from other sides, conquered fortresses, build buildings, fight with wild monsters, make decisions, and so on. Each hero has limited movement per turn, so we can only move around the map what their gauges allow us to share, so we will play well to plan where we want to go with each. Once we go into battle, the scene switches to a sort of board divided by boxes. Here our heroes will not fight directly, but we've units recruited and accompanying our champion. These can be of many different types and each has a unique and well defined characteristics we have to learn us if we lift us to victory, since, for example, some units may go over enemy walls, others attack distance, and so on. Also, once per turn we can use one of the spells you have learned our hero, and I shall notify that are tremendously useful. As you can see, everything is exactly the same and hardly find anything new level in this issue. This also means that the same modes of play, the same player campaigns, the same maps of skirmishes, the same features, full scenario editor and addictive multiplayer mode to go home with the whole afternoons enjoying with friends remain. We must admit that we were surprised how well it has aged the game despite the years that have passed since it was released for the first time, which says a lot of good work being done at the time. A few minutes after starting the program for the first time, we are fully immersed in the adventure, back to 1999 and with all the senses put in what we saw on the screen, planning strategies, adventuring, rediscovering their maps and, ultimately, enjoying as ever. Unfortunately, Heroes of Might & Magic III is not immune to certain problems that detract completely what should have been the updating of a classic. The first and most bloody of all is the unexplained absence of all expansions received the game over the years. These extended the possibilities of title to levels unexpected and offered us by far the best single player campaigns in the series, so it seems impossible to understand the fact that there have been included beyond love them sell as content downloadable. Anyway, for any reason whatsoever, still without any justification as veteran as this game is repeated at an incomplete version. Moreover, to keep the gameplay intact nor has taken the opportunity to make a rebalancing of factions, so we meet with a huge decompensation including some extremely powerful and others that we will always feel at a disadvantage. Yes, we must emphasize the inclusion of a new online multiplayer mode via Steamworks, a detail that is much appreciated and will likely become the main attraction purchase this new version even though not include the above expansions, as it will allow us to play games against other users whenever we want. With regard to your graphics, have been redone and improved virtually every game sprites to suit the current resolutions, which you will notice quickly and getting everything look neat and very clean, showing that there really have been a good job remastering during development and have not been limited to simply include a "mod" that rescale resolution. Finally, say that the soundtrack returns to delight us with a number of songs that fit like a glove to everything we see on screen, from quiet and relaxing to the most epic battles and moved to melodies. Emphasize that the few voices hear (only for videos) are dubbed in Spanish, although the interpretation of the actors is much improved. Heroes of Might & Magic III HD Edition is a game that has left us with some mixed feelings. On the one hand we have the return of a classic for not passing year, a very good job of remastering and the inclusion of an addictive online mode, but on the other hand, the absence of its expansions detract much appeal to a product It could have turned them into a whole must for both fans of the series and those who could never enjoy this great game. If you have desire to relive those afternoons 16 years battling and exploring in front of your monitor, this re-release will offer you just that and in high definition, even if what you want is restructure with the complete and definitive experience of Heroes III and not I care too much that its graphics are not in HD, perhaps you prefer to get your hands on the classic version of Heroes of Might & Magic III: Complete you can find in digital stores like GOG.com.